In 1934, the seven women who founded the Baton Rouge Art League resolved to make the visual arts more accessible to the community. To that end, they and the nine others who formed the new membership developed the following goals: to hold an annual art exhibition, to purchase one artwork each year for a permanent collection that would be publicly displayed, to support student artists with scholarships and the development of public school art programs, and to maintain a significant learning program for BRAL members. These worthy goals continue to guide the present-day BRAL, with 70 active members and some 30 associates. The goals do not, however, reflect the depth of BRAL’s historic contributions to the Baton Rouge arts landscape in Baton Rouge. In 1935, BRAL held its first exhibition at the Heidelberg Hotel. With no local art galleries for the public to visit, the members endeavored to display the finest works by Louisiana artists that they could obtain. 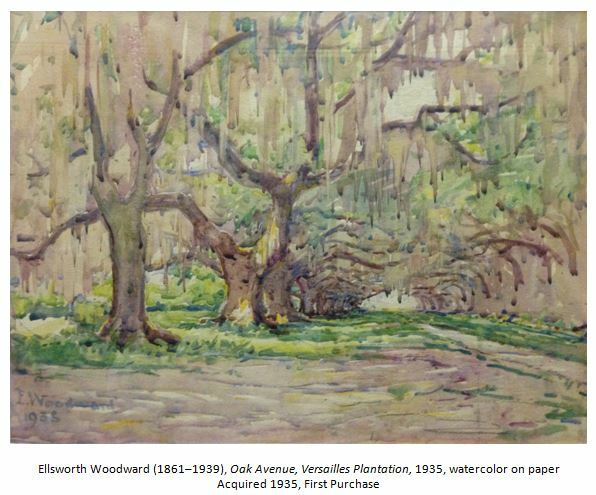 From those works, BRAL began its collection with the purchase of a watercolor by the influential Newcomb College art teacher, Ellsworth Woodward. Throughout its early years, BRAL struggled to secure venues for the annual exhibition. From local churches to members’ homes, various locations served the purpose. As the collection grew, storage was also a persistent concern, and BRAL loaned the collection contents to various public agencies throughout the city. At the same time, BRAL purchased works for donation to other organizations, such as the Audubon etching it gave to St. Francisville’s Oakley house. Today, LSU’s Rural Life Museum is the regular annual exhibition venue, and the Louisiana State Archives houses and exhibits BRAL’s superb permanent collection, which will be maintained in perpetuity for the community’s enjoyment. In 1938, BRAL prompted the state legislature to create the Art Commission for promoting and sustaining all forms of artistic activity in the state. BRAL’s president was on the Art Commission’s board, and BRAL set up the commission and its programs. Almost single-handedly, BRAL kept the commission’s art gallery at the Old State Capitol functioning throughout World War II. For 30 years thereafter, BRAL sponsored separate exhibitions at the gallery for professional and nonprofessional artists. BRAL now invites both established and upcoming local artists to participate together in the annual exhibition and sale. Many of the upcoming artists have subsequently become recognized for excellence, and BRAL is proud to have purchased many of their works for the collection. Following the war, BRAL secured the services of Jay Broussard as the first full-time Art Commission director. Broussard served from 1946 to 1973, when the commission was absorbed into the larger Louisiana Art, Cultural, and Historical Preservation Agency, of which Broussard also became the director. It was the forerunner of the present-day Louisiana Department of Culture, Recreation, and Tourism. Another of BRAL’s vital contributions to the community was its preservation of Louisiana’s Works Progress Administration art collection. At BRAL’s request, the federal government gave the WPA collection to the city of Baton Rouge in 1936. In 1977, BRAL “rescued” the paintings from storage in the Old State Capitol’s basement, had them cleaned, and exhibited them. As a result, the city granted the collection to BRAL, which now loans the collection to Louisiana museums, galleries, and libraries. Notable artists whose works are in the collection include Clarence Millet, Charles Reineke, and John McCrady. BRAL successfully proposed introducing art classes in public schools to the Baton Rouge school superintendent in 1938, and subsequently, BRAL members assisted in the classes. BRAL now annually awards a scholarship to a deserving third-year LSU art student, selected with the aid of the faculty of the LSU College of Art and Design. When the number of members was fewer, the group supported the art education of its members by studying and discussing periods and styles of art. Today, BRAL invites practicing artists and artisans to give presentations on topics ranging from techniques in various media and styles to framing and conservation. In addition, members take field trips to museums, artists’ studios, conservators’ studios, and art galleries. Because BRAL’s resolute, talented members have taken to heart the aim of the BRAL founders, they have supported the arts and artists of our community in so many lasting ways that they cannot all be included in the above statements. BRAL‘s records from 1934 through 1984 are housed in the Louisiana State Archives. More recent records reside with the league historian. Click to read about the collection at the Louisiana State Archives and view some of the paintings. A printer friendly version of the history and a list of art in the collection. 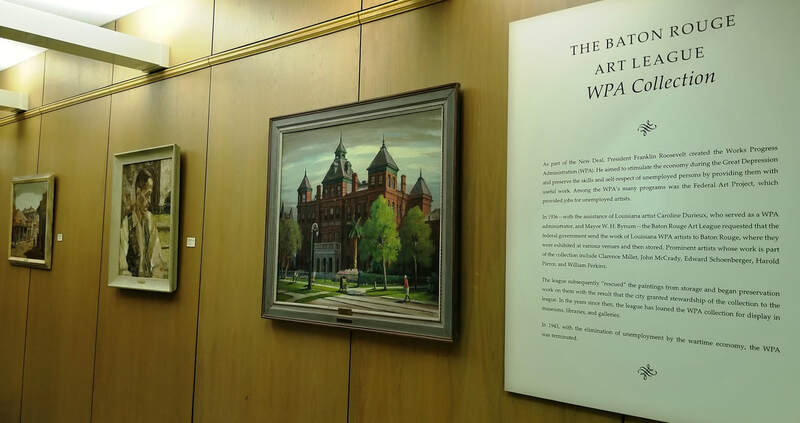 Visitors may view the Baton Rouge Art League WPA Collection at the Louisiana State Archives. 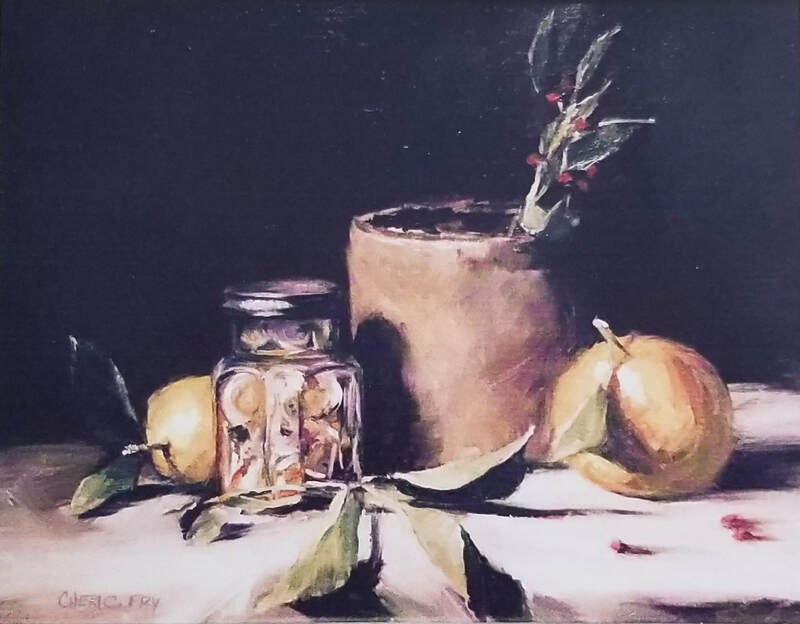 Cheri Fry, "My Favorite Things"
©Baton Rouge Art League 2018 All Rights Reserved.